With the discovery of insulin, we are reminded never to give up hope. Against all odds, Dr. Banting and Best discovered what they called Iletin from pancreas. From there, the battles to procure, isolate, and purify what became known as insulin ensued. It took time, commitment and an understanding of chemistry and technology to save young people against sure death from Type 1 Diabetes. This 15-hour conference will not only look back at the struggles with insulin, but also look at how pharmacotherapy delivery systems today are changing the healthcare of our patients. Discuss the history of insulin and how it laid the framework for drug delivery systems. Discuss Banting and Best discovery of insulin and the intimate details of involving industry in the process. Identify new therapeutic agents recently introduced to the market and explain their drug delivery system. Discuss new devices to aid drug delivery: inhalers, injections, autoinjectors, new pen devices. Describe the most important adverse events and precautions of each new therapeutic agent. Discuss any evidence-based clinical trials that may be published about the medications to aid in therapeutic selection. Describe the connection between drug delivery systems and patient adherence. This lecture will be a comprehensive review of the treatment of heart failure. It is an important topic in this series of discussions on new drug delivery as there are two new FDA treatment options. Both agents have different considerations concerning their pharmacotherapy and one is an injection. Patients with heart failure may now be getting multiple injections for the treatment of their disease. Discuss new pathophysiology findings surrounding heart failure and relate it to the shape of the heart. List the new American Heart Association/American College of Cardiology staging criteria for heart failure. Recognize which forms of heart failure affect predominantly the elderly and gender differences in heart failure type and prevalence. Identify differences in systolic and diastolic heart failure in terms of pathophysiology and approach to treatment. Identify the appropriate dose and important safety considerations for medications commonly utilized in patients with heart failure. Interpret historical and recent clinical trial findings and their impact on heart failure treatment recommendations. Identify medications that may exacerbate and/or precipitate heart failure. What do we need to know in primary care? Monoclonal antibodies are a distinct new medication technology that many primary care practitioners have chosen to ignore learning about. This lecture will focus on the basics, so the clinician can assess efficacy, safety and cost. It is hoped that the learner will be able to discern their role in the use of these medications and offer patient education when needed. Describe the basic pharmacology behind monoclonal antibodies. Discuss how monoclonal antibodies are made. Discuss the nomenclature behind naming monoclonal antibodies. List examples of monoclonal antibodies and the conditions they treat. Discuss the side effects of selected monoclonal antibodies. Discuss risk factors associated with these new technologies. List any general patient education. The purpose of this presentation is to introduce the practitioner to prescription drug abuse and the tension associated with undertreatment versus harmful access of opioid medications. The FDA REMS program will be discussed as well as other techniques the prescriber can use to reduce aberrant behavior and abuse. Practical pain pharmacotherapy pearls and new drug delivery systems will also be addressed. The discussion will also develop the need for multiple adjuvant medications to enhance pain relief. Describe the FDA's concern and request for a new risk evaluation and mitigation strategy (REMS) for prescribing opioids. Discuss the recent articles and concerns about the increase in mortality associated with opioid prescribing. Discuss appropriate prescribing of acute and chronic opioid medications. Distinguish between long-acting and immediate-release opioids, discussing unique delivery systems that make long-acting formulations risky for patients. Discuss measures to reduce deaths from opioid overdose and prescription drug abuse (i.e., inappropriate prescribing, adequate counseling, patient monitoring, patient misuse or abuse). Discuss other adjuvant medications that enhance synergy in pain relief. Discuss adjuvant medications and research data that build our confidence for the need of multiple therapies. Associate Professor of Family Medicine, Department of Family Medicine, McLeod Regional Medical Center, Florence, South Carolina. Adjunct Clinical Assistant Professor, College of Pharmacy, University of South Carolina, Columbia, South Carolina. American Academy Of Family Physicians (AAFP): This Live activity, Primary Care Update Alaska, with a beginning date of 07/23/2016, has been reviewed and is acceptable for up to 15.00 Prescribed credit(s) by the American Academy of Family Physicians. Physicians should claim only the credit commensurate with the extent of their participation in the activity..
Members of the College of Family Physicians of Canada CFPC are eligible to receive MAINPRO-M1 credits for participation in this activity due to reciprocal agreement with the American Academy of Family Physicians. American Academy of Physician Assistants (AAPA): AAPA accepts certificates of participation for educational activities certified for Prescribed credit from AAFP. Physician assistants may report the number of hours stated above of Category I credit for completing this program. American Nurses Credentialing Center (ANCC): Continuing education hours approved by AAFP and by ACPE meet the ANCC-accredited CNE criteria. This course provides Category 1 Continuing Education Hours for certification renewal. The same hours submitted to renew certification may be submitted to a State Board of Nursing for re-licensure. Pharmacists/Pharmacy Technicians: Please ensure that we have your NABP# and date of birth on file. ULS reports credit directly to CPE Monitor. You may download your statement of credit directly from CPE Monitor. (S2) - Premium accommodations and luxurious appointments are the signature of our expansive 460 to 687-square-foot Suites. 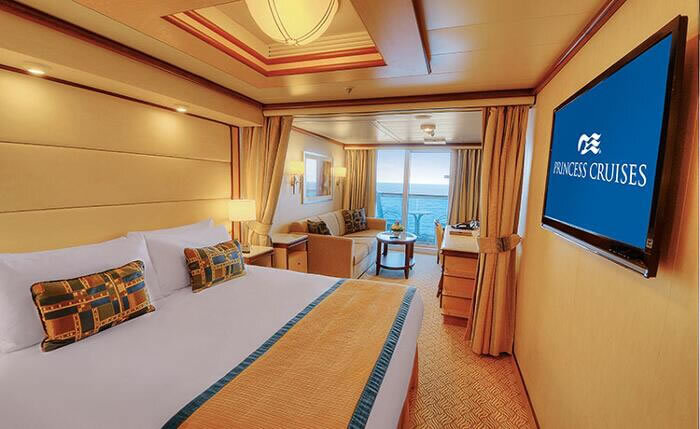 Your Suite stateroom includes a spacious cabin and large 95 to 241-square-foot balcony, along with special suite-only benefits. Suites feature a separate seating area with a sofabed, walk-in closet, full bathroom and deluxe amenities. (MD) - The luxurious Mini-Suite offers approximately 323 square feet of comfort and a separate seating area with a sofa bed for lounging or sleeping a third passenger. The spacious balcony is approximately 57 square feet and the bathroom offers a combination tub and shower. Some Mini-Suites also have a pullman bed to accommodate a 4th passenger. Welcome glass of champagne, Separate seating area with a sofabed, Balcony with patio furniture, Twin beds, Evening bed turn-down, chocolates on your pillow, Two flat-panel televisions, Private bathroom with combination tub and shower, Shampoo, conditioner, body lotion 100% Egyptian cotton linens, Satellite TV, refrigerator, hair dryer, safe, closet, phone and desk, 110-volt, 60-cycle alternating current (AC) with standard U.S. plug fittings Daily housekeeping service. 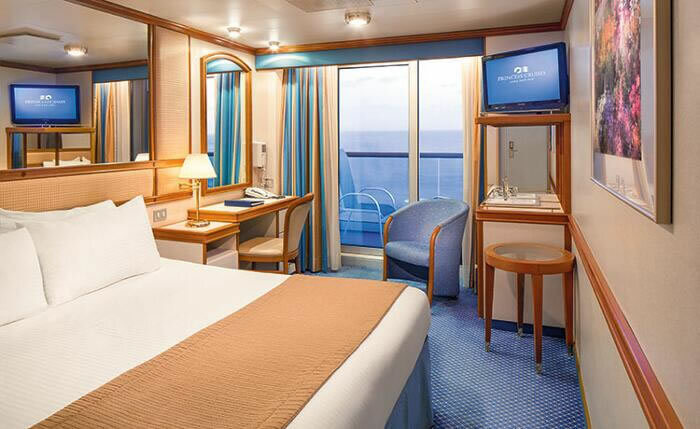 (BD)- The spacious approximately 231-square-foot Balcony stateroom is appointed with fine amenities and outstanding views from an approximately 45-square-foot private balcony. 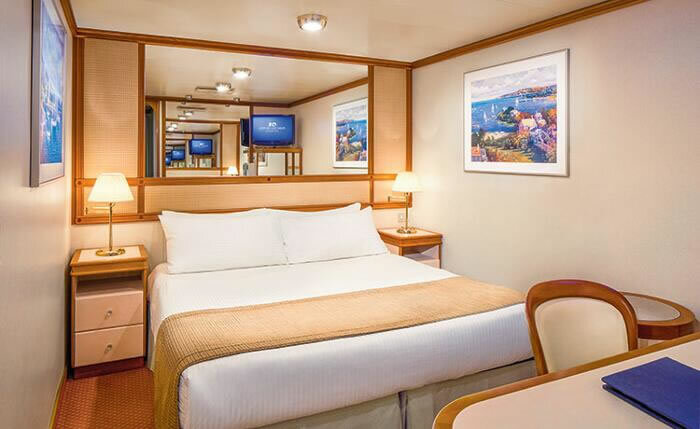 Some staterooms also have pullman beds to accommodate 3rd and 4th passengers. 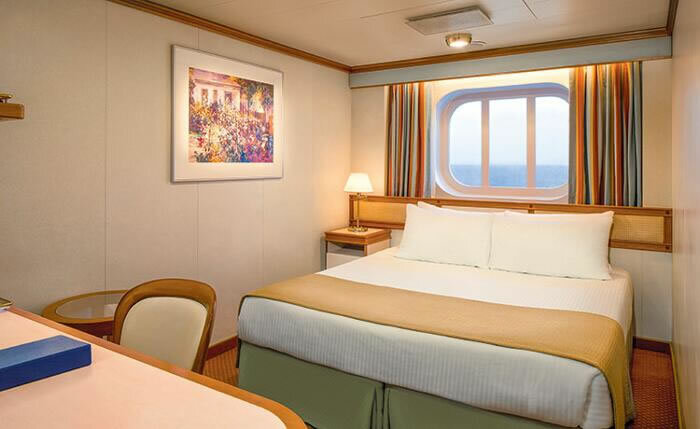 (OF) - The Oceanview stateroom is approximately 179 square feet and features a picture window for memorable views. 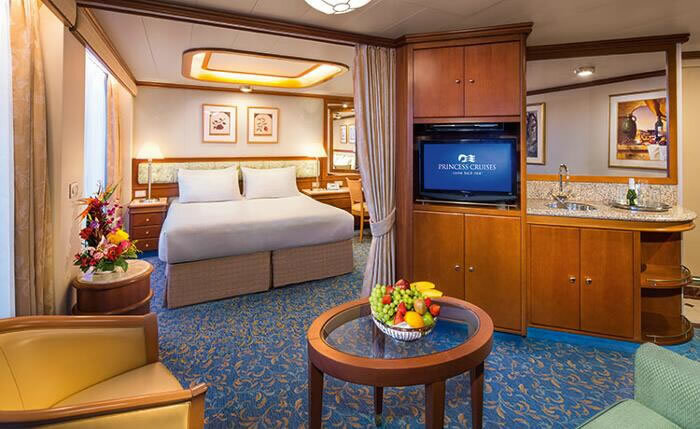 The Oceanview stateroom is richly appointed with fine amenities. 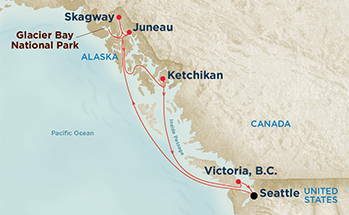 Some also have pullman beds to accommodate 3rd and 4th passengers. Picture window, Twin beds, Private bathroom with shower Shampoo, conditioner, body lotion, 100% Egyptian cotton linens Satellite TV, refrigerator, hair dryer, safe, closet, phone and desk, 110V AC electrical outlet with U.S. plug fittings Daily housekeeping service, Nightly turn-down service. 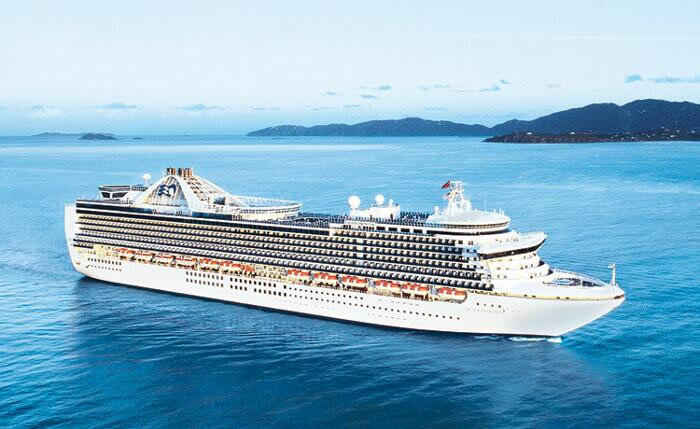 Twin beds, Private bathroom with shower, Shampoo, conditioner, body lotion, 100% Egyptian cotton linens Satellite TV, refrigerator, hair dryer, safe, closet, phone and desk, 110V AC electrical outlet with U.S. plug fittings Daily housekeeping service, Nightly turn-down service.